Want to monitor your kids? Or babysit the babysitter? This easy-to-install wireless network camera makes that simple and affordable. 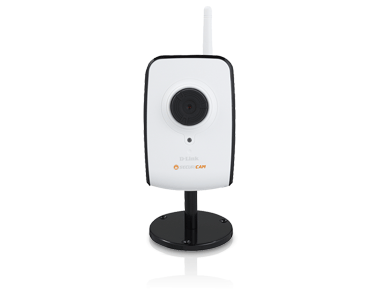 The D-Link® Wireless G Network Camera (DCS-920) connects to a wireless (or wired) network to provide remote high-quality video surveillance. With its sleek compact design, the DCS-920 is an affordable network camera ideal for your home or small business. Since the DCS-920 is a wireless camera, you can place it in areas that have no access to an Ethernet (wired) connection, such as ceilings or high walls. Additionally, with support for WPA®-PSK and WPA2®, the DCS-920 provides you with the highest level of security when connecting to your wireless network, enabling you to stream high-quality MJPEG video quickly and easily to your computer. The DCS-920 adheres to the Universal Plug & Play (UPnP®) specification, which allows for automatic detection and addition to a network. Once recognized by your network, the DCS-920 can be accessed and viewed from “My Network Places” as a device on your network. You can then keep an eye out on your kids, pets, home or office by simply logging onto the DCS-920 web interface using a Java™-based browser from any computer with Internet access, even away from home. For advanced users that want more out of their camera, the DCS-920 also comes with D-Link D-ViewCam™ 2.0 management software. D-ViewCam comes with a host of features including the ability to record directly from the camera to a local hard drive, trigger motion detection, set recording schedules, set e-mail alert notifications, and even support for up to 32 cameras. D-ViewCam also allows you to upload a floor plan of your home or small business and create a realistic layout of where your cameras are located, providing you with better access to your camera. With features such as MJPEG video streaming, wireless connectivity, and D-ViewCam™ 2.0 management, the D-Link Wireless G Network Camera (DCS-920) is a cost-effective and versatile security solution for your home or small business. The D-Link® Wireless G Network Camera (DCS-920) is a versatile surveillance solution that connects to your wireless (or wired) network to provide monitoring for your home or small office. With the DCS-920 installed, you can then keep an eye out on your kids, pets, home, or office from a Java™-enabled web browser such as Internet Explorer®. * Computer must adhere to Microsoft’s minimum system requirements. Use of video equipment for recording the image of a person without their knowledge and consent is prohibited in certain states or jurisdictions. Nothing herein represents a warranty or representation that the D-Link product provided herein is suitable for the end-user’s intended use under the applicable laws of his or her state. D-Link disclaims any liability whatsoever for any end-user use of the D-Link product which fails to comply with applicable state, local or federal laws. All references to speed are for comparison purposes only. Product specifications, size and shape are subject to change without notice, and actual product appearance may differ from that depicted herein.